Pietman Retief, one of South Africa's foremost tour guides, was honoured by the prestigious Institute of Winemasters recently in Stellenbosch. 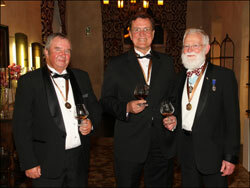 His award as Wine Personality of the Year acknowledged his contribution to the wine, brandy and tourism industry spanning more than 40 years. 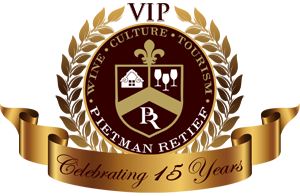 Pietman Retief is retained by several leading UK-based tour companies and is well known for his VIP one day tours in the Cape winelands. He also runs tailor made tours in the region. Formerly head of the PR division of Distillers Corporation (now Distell) and director of the Brandy Foundation, Pietman has led more than twelve tours worldwide promoting South African wine and brandy. He is a past recipient of the South African Tourism award for best tour guide at Indaba Travel Expo. 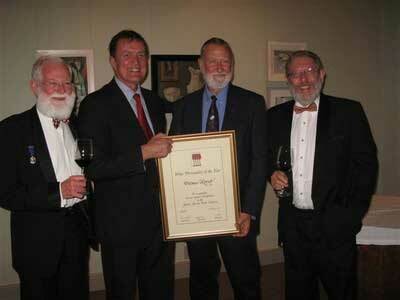 Pietman is seen accepting the Wine Personality of the Year award from the Cape Wine Masters. Recommended by The Sunday Times London, Conde Nast Publications Group including Vanity Fair and GQ magazines New York.